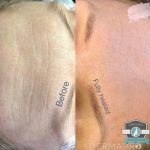 Plasma Skin Tightening is the only cosmetic treatment to use plasma to eliminate excess skin. It is known for it’s success with Non Surgical Eye lift, Scar Lifting Treatments, Wrinkle reduction, Tummy tightening and so much more. The term “soft surgery” is often used to describe the treatment because it delivers results similar to surgery without a scalpel, stitch or bandage and minimal downtime. It is a minimally invasive procedure with a much lower risk and at a more affordable price then actual surgery. 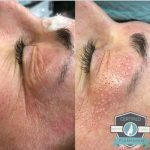 Plasma Skin Tightening is a relatively new innovation in the beauty industry in North America but has been used for a number of years in Europe. The extremely accurate device works by utilizing the voltage in the air between its metal tip and the skin, to form a plasma charge. An electrical arc is created and instantly shrinks the targeted skin. 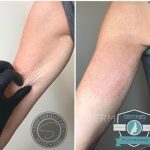 The tissue retraction and tightening gives results that are comparable to invasive surgery by physically reducing the volume of skin in the surrounding area. The PlasmaPRO device creates a tiny plasma flash which leaps from tip of the device to the skin in a micro sized point. 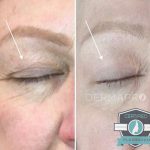 This superficial point targets the skin in its immediate vicinity – which reduces the excess skin, tightening the lid / under eye area. A series of tiny brown spots are strategically placed to attain the desired result for the excess skin. The skin around the spot tightens instantly, pulling the cells closer together. 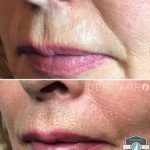 Plasma Skin Tightening is able to treat a number of imperfections without any actual cutting of the skin. 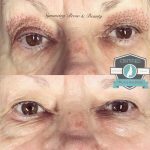 Eyelids- upper/lower and excess upper eyelid skin. 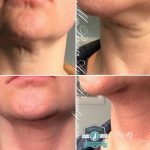 As Plasma Skin Tightening is more than a simple tightening treatment, skin is actually removed, so the effects should last as long as they would with invasive surgery. Like all surgical and cosmetic procedures, the effects of Plasma treatment are not entirely permanent as it does not stop any further ageing. The positive results can last your client years, depending on the area treated. 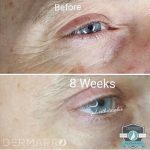 The positive effects of treatment will be noticeable immediately after the first treatment, but the best results will be seen by the 8th week as the skin has had time to go through a full regenerative cycle. For some, an additional treatment may be required after 8 weeks for maximum results. Additionally, there are lifestyle factors that can prevent the result from lasting as long as they can, such as smoking, alcohol consumption, and prolonged sun exposure. Those planning on treatment should also be aware that their race and genetics can also have an effect of the length of beneficial effects. 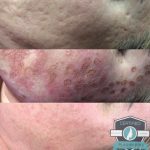 The number of treatments required will vary according to the condition being treated, skin’s laxity, the desired degree of correction and the individual’s response to the treatment. Appointments must be spaced out 6-8 weeks. 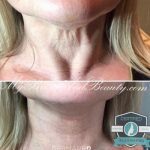 Plasma Skin Tightening has been shown to be a safe treatment due to its non-invasive nature. Still the majority of clients are likely to experience some minor side effects in the 7-10 days following treatment. The client should be in good health at the time of the appointment, with no preexisting health conditions. If the client displays signs of cold or flu the treatment should be rescheduled. Clients with a sunburn/sun tan should postpone treatment for up to 8 weeks or until tan/burn signs disappear. The client must not display Herpes Simplex Virus (Cold sores/Fever blisters). Your client will need to reschedule their appointment if they are experiencing an outbreak. You will need to be very specific with this question as when you are working in and around the lip area this will likely trigger an outbreak on anyone who has ever experienced the virus. If they have experienced Herpes Simplex Virus (Cold sores/Fever blisters) in the past they must see their Medical Doctor and obtain a prescription for Valtrex and begin taking it 3 days before treatment and for 4 days following treatment. If the client wears a pace-maker avoid treatment with electrical arcing as the currents may disrupt the rhythem of their device. Do not treat Clients who are pregnant or breastfeeding. They are not ideal candidates. This treatment is only recommended on Fitzpatrick Scales 1-3 . Anyone past this scale is at risk for Hyperpigmentation. 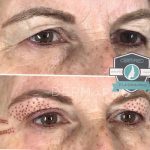 Clients with Eyelash extensions receiving upper or lower eyelid treatment MUST have lashes removed prior to treatment and reapplied after 8 weeks. 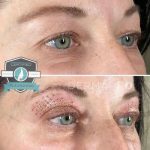 Eyelash extensions can be full of bacteria and due to the swelling that takes place, the extensions can imbed into the eyelid causing discomfort. On the treatment day, it is recommended that no make-up is worn on the treatment area. We suggest taking an anti-histamine (such as benadryl) 30 minutes prior to your appointment to help with swelling and continue to take anti-histamines for 2-3 days following your appointment. An numbing agent is applied and left to take effect for up to 30 minutes. When the treatment area is sufficiently numb, the session begins with multiple connections of the plasma tip, spaced closely together. You may feel some heat in the treatment area, which may be uncomfortable and slightly irritating. Treatment time is usually between 10-40 minutes, depending on the size of the area. Immediately after treatment the area will be red and mildly swollen with small crustations and discolouration. You may experience a sensation similar to a sun burn which will likely last a few hours. Swelling may intensify over the following few hours and more so when eyes are treated and may last 3-5 days. The crustations/discoloration should resolve within 5 -12 days depending on the individual and area treated. 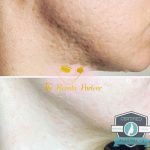 Results are seen instantly after the treatment, although this gradually improves over the course of the following 8 weeks. Essentially there is downtime, but it is considerably less then with surgery. Following treatment you will be given thorough aftercare instructions to ensure that you see the best results. You will be given a specially developed medical aftercare product to promote healing and sooth the initial discomfort. In the week following treatment (or until the treatment area has fully healed) use only a mild PH balanced soap (Dove) and water to gently cleanse the treated area ensuring it is completely dry. Avoid rubbing the area. cost of traditional, open surgery, it is about 50 – 75% less. Price lists are available and also on my facebook page “Symmetry Brow Studio” listed under services.